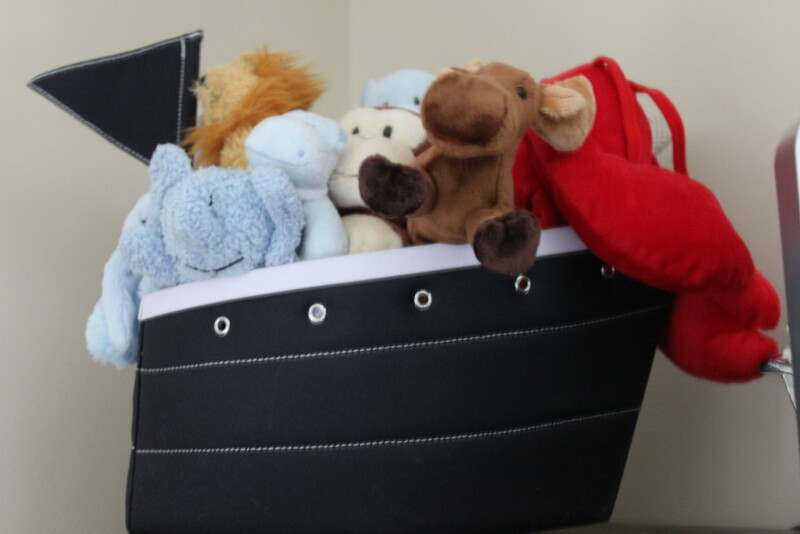 This contemporary nautical nursery was designed for my baby boy Camden. Most of the nursery was done before he arrived but the final touches (including personalized touches) came after he was born. My fiancee and I met on a sailing trip 4 1/2 years ago and we share a love for the water and sailing! I knew I wanted a nautical themed nursery but one that would grow with him through the years. It all started with the curtains and took off from there! I got a lot of inspiration from Pinterest of course! I wanted the room to be "Nautical Chic". My desire was a nautical feel but one that would still fit him when he is a teenager! I would describe my style as contemporary. Furniture is from Pottery Barn Kids. Dresser, nightstand and crib all part of the Larkin collection. Nautical maps were a DIY project with help from Kristy Cavaretta Designs. The maps are from the sail guidebooks of trips that my fiancee and I went on together. The "bookends" of the project were the curtains and the Camden nautical pillow. They were the first and last pieces to the project and I just love them! My other favorite items are the prints above the crib. They were designed especially for Camden and his nursery! My wish is that he treasures them as much as I do when he grows up! Pinterest and Etsy have great ideas! Start with one big item you love and let it flow from there! Love it! So classic & clean looking!!! Wow, this is really nautical through and through. And I super love what you did with that framed CAMDEN. I love the Camden pillow. Did you have someone make it or did you make it? So cute! My name is Camden and I love sailing. Love the room! We are naming our son Camden too and LOVE your nursery. Where did you find the “Camden” pillow? love this nautical theme nursery, Im doing the same theme for my son, what this the name of the color in the wall? What shop on etsy did you purchase these curtains? They are exactly what I am looking for! I love this nursery! What is the paint color you used? I LOVE this nursery. I was looking for the rug at flor.com but couldn’t find it. Do you have a product number or know how I can find it? Where did the light fixture come from?? which etsy store did you use for your curtains? Very cute! What color did you use on the walls? What color did you paint the walls? Where did you get the whale pillow? beuatiful nursery! Do you happen to remember what paint color you used? Thanks! I am also curious about the Whale pillow. What etsy shop is it from? I love the rug you made! I would like to make one, but I have not been able to get someone from flor to help. Do you possibly remember the names of the tiles you used? Would you share the info? Hi! I have almost the same design with the pbk stuff! Can you send me the colors of the carpet from Flor? Is it soft? Looks awesome. Nice job! I’m looking for that rug on flor and can’t find it :( does it have a name? Thanks! This is soo beautiful!! I love it! It is so perfect. The final touches are great and the overall design modern and chic. PERFECT! Hi, I was curious as to what buyer you purchased your curtains from on Etsy, and the color paint you used on the wall? Love this room! Can you please share the link for the curtains? What is the color on the walls?? Love this nursery! Any contact information for the seller of the curtains? I am mom to Camden James (23 months) and Sawyer Patrick (7 weeks) and live in Portsmouth, NH.